Séguret is a beautiful hillside village situated just east of the Dentelles de Montmirail in the Southern Rhône Valley. 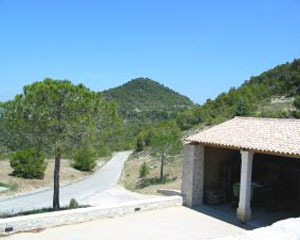 Domaine De Mourchon is set in the hills behind Séguret at an altitude of 350 metres and the vineyards are divided into a series of hillside parcels. I first met the proprietor/founder of Domaine De Mourchon, Scotsman – Walter McKinlay in 1997 when the winery was still a construction site. Nick Thompson, the proprietor/wine-maker at Domaine De l’Ameillaud in Cairanne was the consultant wine-maker to Domaine De Mourchon; Sébastien MAGNOUAC is currently the wine-maker and has been since 2000. This gleaming eight-year-old space-age winery wouldn’t look out of place in any ‘New World’ wine producing region. The point of difference being the 35 to 55 year old vines growing in the clay, limestone and grey sandstone which characteristically provide Séguret with its dark color, full-body, plenty of spicy fruit, and firm structure courtesy of the powerful ripe tannins. The Mourchon wines have the potential to mature and develop in the cellar for up to ten years. As is typical of the area Grenache is the most widely planted variety and is complemented with Syrah, Carignan and Cinsault. [60% Grenache, 30% Syrah, 5% Carignan, 5% Cinsault] 35 year old vines 35 Hl/Ha – Bright ruby red, nice florals, no reduction issues, very fruity with dark plum and the palate is juicy rich plump fresh vibrant, good grip but the tannins are ripe and buried, fine acidity. A beautifully balanced full-bodied Grenache-based wine. Nicely pitched ripe damson, plum and raspberry with nicely judged background oak adding texture and complexity. The palate is slippery rich and sweet ripe plum and berry ganache and kirsch, nice puppy fat and good length.